Motorola reported a phenomenal 600 percent leap in earnings this quarter, but is still behind Apple in mobile units sold and is far behind in smartphone sales, leaving Apple the top US phone vendor by units for the second quarter in a row. Motorola has greatly increased is profits due to a its push with Verizon Wireless in selling the Android-based Droid, also marketed as the Motorola Milestone. The latest model, Droid X, is currently the model being held up against iPhone 4. 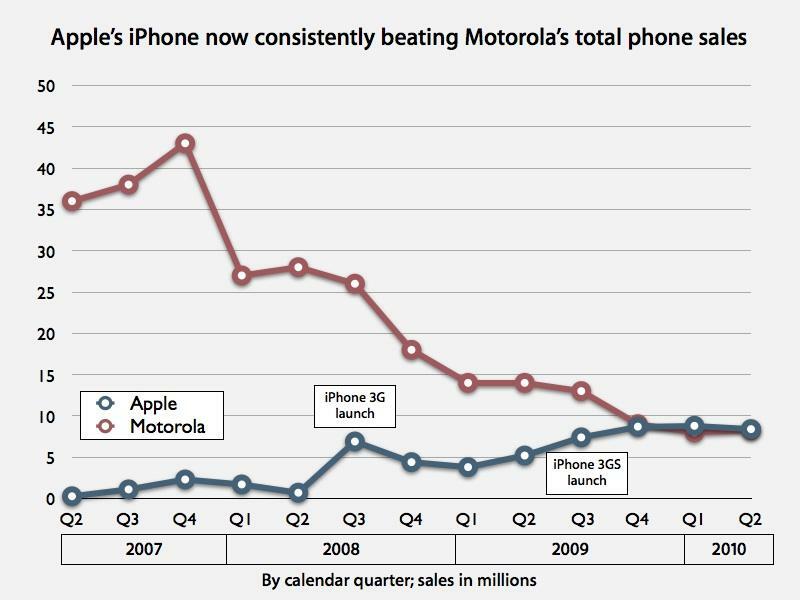 Motorola's quarterly sales of 8.3 million phones is still behind Apple's 8.4 million units in the second calendar quarter of 2010, which ended in June. However, only 2.7 million of Motorola's sales were smartphones, meaning Apple sold more than three times as many smartphones as the leading Android maker. In comparison, Taiwan's HTC (the manufacturer of Google's Nexus One, Verizon's Droid Incredible and Sprint EVO) sold 2.8 million phones in the first quarter of 2010, or 3.5 million counting its OEM sales through other vendors. It expected to sell a total of 4.5 million in the second quarter. Motorola has seen a sharp decline in the total number of phones it has shipped since the iPhone arrived in 2007. In the last three quarters of 2007, the company was selling more than 35-40 million devices per quarter. In 2008, Motorola's shipments fell down into the range of 25 million per quarter, ending the year under 20 million. In 2009, the company's quarterly sales consistently slipped under 15 million. This year, the company hasn't reached 9 million in sales of all phones, with its smartphone sales being below 3 million. In contrast, Apple has incrementally expanded its iPhone sales as it entered new markets internationally and began adding new carriers. The company's June quarter results were particularly impressive given the media attention devoted to the publicized iPhone 4 prototype, which Apple feared would result in depressed sales as customers anticipated the new model launch.